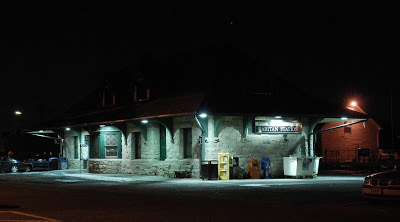 Located at MP 35.8 on NJT’s RVL, this station was built back in the 1890’s. Documentation about the station construction is almost non-existent. The only clue as to who built can be found in the former baggage room where an inscription reads “Built by the C.R.R. of N.J.” The station was constructed using rock face ashlar block and originally also had a slate roof. That has since been replaced with asphalt shingles. On June 22, 1984 it was added to the National Register of Historical Places. Photo 1: As the sun sets on January 27, NJT Train 5528 slows for its stop at Raritan at 5:15. 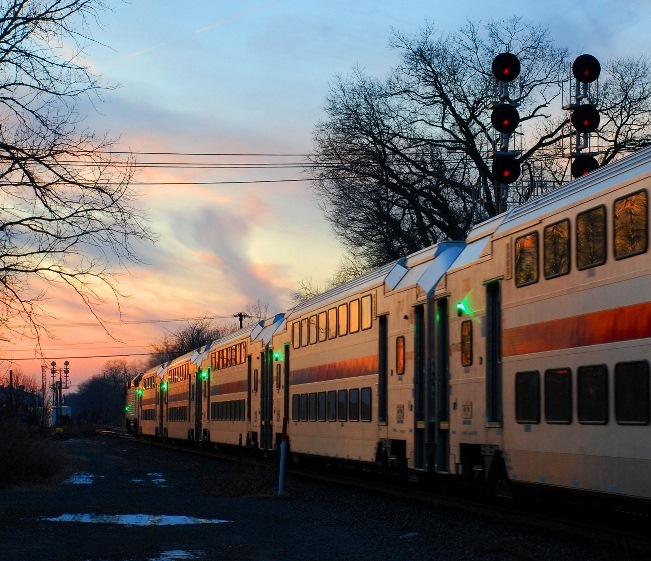 NJT’s weekend schedule will show Raritan as the last stop. Monday through Friday is when the trains will terminate in High Bridge (NJ). 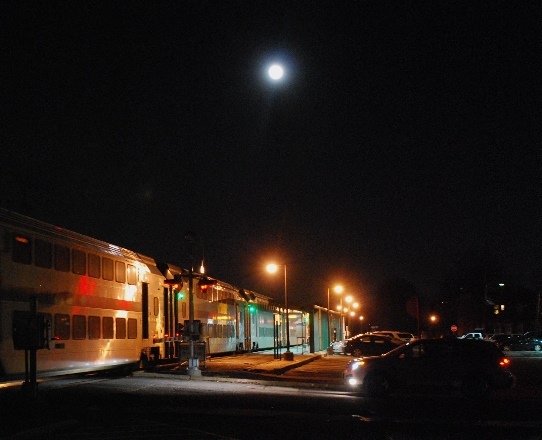 Photo 2: NJT Train 5530 is preparing to depart Raritan under a full moon on a bitter cold January 26th night. Photo 3: Seen here on January 26th, NJT’s Raritan Station is 1 ½ stories high has two dormers with gabled roofs on the north and south sides. The east and west sides have a single gabled dormer without side walls. NORFOLK, VA. – The Norfolk Southern Foundation, the charitable giving affiliate of Norfolk Southern Corporation, awarded $7 million in grants to nonprofit charitable organizations during 2012, a 13 percent increase over 2011. The NS Foundation supports programs to help nonprofit organizations in providing food, shelter, and medical care to those in need; expanding educational opportunities for children; preserving the environment; and promoting arts and culture. “As a leading transportation provider, we believe we also should take the lead in investing in the communities where we operate,” said Norfolk Southern CEO Wick Moorman. · $2.55 million to 80 United Way campaigns and other health and human services groups: More than $1 million of this amount was distributed among The American Red Cross to assist with Superstorm Sandy relief; ForKids Inc. to help homeless families with children become self-supporting; and food pantries, including the Foodbank of Southeastern Virginia, Central Pennsylvania Food Bank, Atlanta Community Food Bank, and Feeding America Southwest Virginia. · $1.24 million to cultural and performing arts groups, including: Virginia Arts Festival, Virginia Opera, Virginia Symphony, Virginia Stage Company, Chrysler Museum, North Carolina Transportation Museum, Western Virginia Foundation for the Arts and Sciences, Woodruff Arts Center, and Zoo Atlanta. · $1.14 million to educational organizations: Benefiting from the 15 percent funding increase in this category were Virginia Early Childhood Foundation and Smart Beginnings-Hampton Roads, which prepare children to enter kindergarten; the ACCESS Scholarship Foundation, which provides scholarships to enable high school graduates in Hampton Roads to attend college; and 16 universities that received $300,000 in grants under the Norfolk Southern College Partnership Program. This program, established in 2006, builds relationships to enhance the railroad’s recruiting opportunities, particularly for business and engineering graduates. · $345,000 to civic, community, and environmental groups: As part of its environmental support, the Foundation provided grants to the Chesapeake Bay Foundation, Nature Conservancy of Virginia, and Elizabeth River Project to protect ecologically important lands and waters for nature and people. NS also supported the American Chestnut Foundation’s project to reforest reclaimed mine sites in Pennsylvania, Ohio, West Virginia, Virginia, and Kentucky with native, disease-resistant American chestnut trees. Each year, the NS Foundation gives its operations division employees an opportunity to recommend eligible nonprofit organizations in their communities to receive grants. During 2012, $180,000 was awarded to police, fire, and emergency response organizations; school programs; and historical and community groups as part of NS’ local discretion grant program. Overall, grants were made to 350 organizations in NS’ operating territory, and an additional 525 organizations benefitted from $1.66 million in employee matching gifts. In 2013, the Foundation again will award $7 million in grants. Since its creation in 1983, the Foundation has contributed nearly $131 million to thousands of civic and charitable organizations throughout Norfolk Southern’s territory. In the last five years, it provided more than $29.6 million in contributions. Grants are awarded to eligible organizations located within Norfolk Southern Corporation territory. Applications for 2014 funding will be accepted July 15-Sept. 30, 2013. For information about eligibility and application procedures, visit Norfolk Southern Foundation. NORFOLK, VA - Norfolk Southern Corporation plans to spend $2 billion in 2013 for capital improvements to its rail transportation network. The largest expenditure will be $831 million for roadway improvements, including the maintenance and replacement of rail, crossties, ballast, and bridges to ensure the continued safe and reliable operation of the railroad. Equipment spending includes $420 million to acquire new locomotives and rebuild and upgrade existing units; re-body coal cars; buy multilevel freight cars to handle increased automotive traffic; and purchase intermodal containers and chassis. NS has budgeted $229 million, about 11 percent of the 2013 budget, for the continued implementation of positive train control. Investments in facilities and terminals are anticipated to be $203 million and include the continuation of a multi-year project to expand Bellevue rail yard in Northern Ohio; construction of a new intermodal terminal in Charlotte, N.C., as part of Norfolk Southern’s Crescent Corridor initiative; completion of a new locomotive service facility in Conway, Pa.; and new and expanded bulk transfer facilities. Norfolk Southern also expects to spend $84 million in infrastructure improvements to increase main line capacity, accommodate traffic growth, and provide NS’ match for innovative public-private partnership investments such as CREATE in Chicago and the Crescent Corridor, which will improve the nation’s transportation infrastructure, reduce fuel consumption and air pollution, and relieve highway congestion by moving freight off highways onto rail. Technology investments of $57 million are planned for new and upgraded systems and computers to enhance safety and improve operating efficiency and equipment utilization. located on 141 Bulls Head Road, Pottsville, PA.
2:50 PM to 4:00 PM: Craig Worley, Kantner Slide Collection. The cost is $30.00 per person. Checks can be made payable to Project 113 and sent to Project 113, 113 East Sunbury Street, Minersville, PA 17954. For information phone: 570-544-8300 or email: rrproject113@hotmail.com. JACKSONVILLE, Fla. - January 25, 2013 - CSX Corporation (CSX) and its transportation and intermodal terminals subsidiaries today announced an expansion of the company's intermodal presence in the greater Montreal region and Quebec. CSX's intermodal terminals subsidiary will build a new 36-hectare (89-acre) intermodal rail terminal in the City of Salaberry-de-Valleyfield in Quebec, connecting the region with CSX Transportation's (CSXT) 34,000 kilometer (21,000-mile) rail network in the United States. Michael J. Ward, CSX's Chairman, President and Chief Executive Officer, made the announcement today in Salaberry-de-Valleyfield at a press conference with Quebec's Transport Minister Sylvain Gaudreault and Salaberry-de-Valleyfield Mayor Denis Lapointe. The new $100 million project will enable shippers in the region to capitalize on the economic and environmental benefits of intermodal rail, expand on the north-south trade opportunities offered by NAFTA, and connect to new markets. The project is expected to create about 600 jobs during construction and lead to the creation of more than 300 permanent jobs when completed. Construction is expected to start in the spring of 2013 and the terminal is expected to open in 2015. "We believe this new terminal will provide immediate and long-term benefits to Quebec and to Salaberry-de-Valleyfield," said Mr. Ward. "The terminal will provide an anchor for the development of new business, helping boost the economy and create jobs while helping the environment and reducing congestion on the highways." Trains serving the terminal will connect through the Northwest Ohio intermodal hub, offering quick and efficient access to markets across the United States. Located in the Perron Industrial Park, the terminal will be close to the newly-completed Autoroute 30, providing easy access to the greater Montreal distribution and consumption market. As part of the project, the province of Quebec and Salaberry-de-Valleyfield will make improvements to the road network in the immediate vicinity of the terminal. The Quebec Ministry of Transportation will also support the project through a $6 million grant for the reduction of greenhouse emissions. The terminal is expected to handle up to 100,000 containers per year, using modern, rubber-tire gantry cranes to transfer containers between trains and trucks. In response to community planning needs, CSXT will also relocate a portion of its main line in residential areas of Salaberry-de-Valleyfield to a location south of Autoroute 530 alongside the new terminal in the industrial park. CSX is proud of its 125-year history in Quebec, dating to the St. Lawrence and Adirondack Railway Company. The project is subject to regulatory approval from the Canadian Transportation Agency. Based in Jacksonville, Fla., CSX Corporation along with its subsidiaries is one of the nation's leading transportation companies, providing rail, intermodal and rail-to-truck transload services. The company's transportation network spans approximately 21,000 miles, with service to 23 eastern states, the District of Columbia and two Canadian provinces. The rail network of its subsidiary, CSX Transportation, connects more than 240 short line railroads and more than 70 ocean, river, and lake ports. More information about CSX Corporation and its subsidiaries is available at www.csx.com. Like us on Facebook (http://www.facebook.com/OfficialCSX) and follow us on Twitter (http://twitter.com/CSX). Jacksonville, Florida - January 24, 2013 - CSX Corporation's railroad subsidiary, CSX Transportation, Inc. (CSXT), working in concert with the Commonwealth of Massachusetts, has opened New England's first double-stack cleared intermodal route on its rail line between the New York state line and the newly-expanded intermodal terminal in Worcester, Mass., benefitting businesses and consumers in central New England by reducing transit times on key lanes by as much as 24 hours. The project involved increasing vertical clearances at 31 locations between Worcester and New York State to 21 feet, enabling intermodal trains to operate with containers stacked two-high. The project connects with the double-stack cleared rail network at the New York state line, giving the region the ability to link with double-stack intermodal service throughout the country. Previously, double-stack intermodal trains coming to New England from the Midwest or from Western origins had to stop in Syracuse, NY, to be converted from double-stack to single-stack configurations. The reverse occurred on Westbound routes from New England, adding time, cost and complexity to these freight flows. The result is faster, more efficient, more reliable, more economical and environmentally friendly freight rail service to and from the region. The project was part of a larger agreement with the Commonwealth that enabled Massachusetts to acquire CSXT's rail lines in the Boston area to increase commuter rail service. In conjunction with that project, the intermodal terminal in Worcester was expanded, creating a world-class intermodal container transfer facility with excellent proximity to New England's highways, distribution centers and the consumption market, and solidifying CSX's strength in the region. "This is an excellent example of how the public and private sector can work together on projects that benefit the public, strengthen the economy, and enable highway to rail freight conversion to reduce strain on public infrastructure and serve supply chains seamlessly," said Clarence W. Gooden, CSX's executive vice president and chief commercial officer. Based in Jacksonville, Fla., CSX Corporation along with its subsidiaries is one of the nation's leading transportation companies, providing rail, intermodal and rail-to-truck transload services. The company's transportation network spans approximately 21,000 miles, with service to 23 eastern states, the District of Columbia and two Canadian provinces. The rail network of its subsidiary, CSX Transportation, connects more than 240 short line railroads and more than 70 ocean, river, and lake ports. More information about CSX Corporation and its subsidiaries is available at www.csx.com. Like us on Facebook(http://www.facebook.com/OfficialCSX) and follow us on Twitter (http://twitter.com/CSX). NORFOLK, VA. – Jerry W. Hall has been named vice president intermodal operations to succeed Robert E. Huffman, who is retiring Feb. 1. Hall, a civil engineering graduate of the University of Alabama, joined Norfolk Southern as a management trainee in Hattiesburg, Miss., and progressed through numerous positions in Norfolk Southern’s transportation department, including superintendent of the Dearborn, Harrisburg, and Lake divisions, until his appointment as general manager of the Northern Region in 2009. He will be headquartered in Norfolk and will report to Donald W. Seale, executive vice president and chief marketing officer. Huffman is a veteran of 40 years with the railroad industry, having joined Penn Central as a block operator in 1972. He joined Conrail as assistant trainmaster in 1975 and served in positions of increasing responsibility in the operations department and joined Norfolk Southern in 1998 as senior assistant vice president intermodal operations, becoming vice president intermodal operations in 1999. “Bob brought a wealth of experience and a lot of great ideas to our intermodal operations,” said Seale. “His contributions will be missed, and we wish him the best in his retirement. JACKSONVILLE, Fla. - January 22, 2013 - CSX Corporation (NYSE: CSX) today reported fourth quarter 2012 net earnings of $443 million, or $0.43 cents per share, compared to $457 million, or $0.43 cents per share, in the prior same period. For the full year 2012, net earnings were $1.9 billion, or $1.79 per share, up from $1.8 billion, or $1.67 per share, in 2011. For both the fourth quarter and the full year, the EPS performances reflected shares repurchased in 2012. "CSX continues to demonstrate the underlying strength of its business model, the ability to respond quickly to significant events in the marketplace, and a steadfast focus on creating substantial shareholder value over the long term," said Michael J. Ward, chairman, president and chief executive officer. For the quarter, total revenue of $2.9 billion declined 2 percent. The company saw an increase in merchandise and intermodal shipments, but these gains were more than offset by declines in coal resulting from low natural gas prices, high coal inventory at utilities and lower global demand. As a result of the lower revenue, which was partially offset by strong efficiency gains, operating income declined 4 percent to $804 million and the operating ratio increased 60 basis points to 72.1 percent. For the full year, operating income increased 1 percent to $3.5 billion and the operating ratio improved 30 basis points to 70.6 percent. Both improved on the strength of efficiency gains and resource adjustments. CSX also delivered exceptional safety and service levels throughout 2012. Its personal injury rate was the best ever recorded for both the quarter and the full year, and the train accident rate for both time periods was near all-time best levels. Additionally, service levels remain high across all key measures, with customer satisfaction ratings at record levels. This sets a strong foundation for long-term growth and value creation for the company's shareholders. CSX executives will conduct a quarterly earnings conference call with the investment community on January 23, 2013, at 8:30 a.m. Eastern time. Investors, media and the public may listen to the conference call by dialing 1-888-327-6279 (888-EARN-CSX) and asking for the CSX earnings call. (Callers outside the U.S., dial 1-773-756-0199). Participants should dial in 10 minutes prior to the call. In conjunction with the call, a live webcast will be accessible and presentation materials will be posted on the company's website at http://investors.csx.com. Following the earnings call, an internet replay of the presentation will be archived on the company website. JACKSONVILLE, Fla. - January 23, 2013 - CSX Corporation (NYSE: CSX) today announced that it plans to invest approximately $2.3 billion in its business in 2013. The investments will support initiatives to help meet the nation's long-term demand for freight rail, improve customer service and further the company's plans for long-term profitable growth. "The continued strong investment in CSX is a clear reflection of our desire to bring lasting transportation solutions to our customers, as well as to enable the inevitable movement of even more freight to rails," said Michael J. Ward, president, chairman and chief executive officer. Ward noted that overall growth excluding coal should be at a rate above the general economy in 2013. Long-term increases in demand are expected to occur as the population and its consumption rise, as global trade creates the need to move more products between ports and people, as the highways become more congested, as the reindustrialization of the U.S. gains momentum, and as shippers become increasingly aware of the environmental benefits offered by rail. CSX addresses those challenges and opportunities by serving customers across a broad array of industries, including in some of the biggest and most active consumer markets in the world. The $2.3 billion - which was outlined in the company's fourth quarter and full-year earnings presentation this morning - will fund critical network enhancements and fleet upgrades. Many of the investments are related to long-term initiatives that give customers greater access to an increasingly interconnected global transportation network. This includes the company's National Gateway initiative creating double-stack intermodal train access between the Mid-Atlantic ports and the Midwest. The investments are also expected to include $325 million associated with the implementation of the industry's Positive Train Control program. CSX has invested $7.8 billion in its network over the past four years. These investments are part of the company's balanced approach to capital deployment, which also includes dividends and share repurchases. · Railway operating revenues were $2.7 billion. · Income from railway operations was $714 million. · Net income totaled $413 million. · Diluted earnings per share were $1.30. · The railway operating ratio was 73.4 percent. · Railway operating revenues were $11 billion. · Income from railway operations was $3.1 billion. · Net income was $1.7 billion. · Diluted earnings per share were $5.37. · The railway operating ratio was 71.7 percent. NORFOLK, VA. – Norfolk Southern Corporation today reported fourth-quarter 2012 net income of $413 million, or $1.30 per diluted share, compared with $480 million, or $1.42 per diluted share, earned in the fourth quarter of 2011. Net income for 2012 was $1.7 billion, or $5.37 per diluted share, compared with $1.9 billion, or $5.45 per diluted share, earned in 2011. Fourth-quarter railway operating revenues were $2.7 billion, down 4 percent compared with the same period of 2011. For 2012, railway operating revenues were $11 billion, 1 percent lower than 2011. General merchandise revenues were $1.4 billion, 4 percent higher compared with fourth-quarter 2011 results. For 2012, general merchandise revenues increased to $5.9 billion, 6 percent higher compared with 2011. Traffic volume increased 1 percent in the quarter and 2 percent for the year compared with the same periods of 2011. Coal revenues were $657 million, 23 percent lower compared with fourth-quarter 2011, and $2.9 billion for 2012, 17 percent lower than 2011. Coal traffic volume declined 13 percent both in the quarter and for 2012 compared with the same periods of 2011. Intermodal revenues increased to $584 million, 5 percent higher compared with fourth-quarter 2011. For the full year, intermodal revenues reached $2.2 billion, up 5 percent compared with 2011. Traffic volume increased 4 percent in the quarter and 5 percent for 2012 compared with the same periods of 2011. Fourth-quarter railway operating expenses were $2 billion, 1 percent lower compared with the same period a year earlier. For 2012, railway operating expenses were $7.9 billion, also down 1 percent compared with 2011. Income from railway operations was $714 million, 11 percent lower compared with fourth-quarter 2011, and $3.1 billion for 2012, 3 percent lower compared with 2011. The railway operating ratio increased 3 percent to 73.4 percent during the fourth quarter and rose 1 percent to 71.7 percent for 2012 compared with the same periods of 2011. NORFOLK, VA. – Norfolk Southern Corporation today announced the regular quarterly dividend of 50 cents per share on its common stock, payable on March 11, to stockholders of record on Feb. 1. Since its inception in 1982, Norfolk Southern has paid dividends on its common stock for 122 consecutive quarters. GREENCASTLE, PA. – Norfolk Southern today opened its third Crescent Corridor intermodal facility, a new $97 million terminal in South Central Pennsylvania that advances the company’s multi-state rail infrastructure initiative connecting the Southeast and the Northeast. The Franklin County Regional Intermodal Facility, located on 200 acres south of Greencastle and less than a mile from I-81, will connect Central Pennsylvania, Western Maryland, and Northern Virginia to domestic and world markets while creating some 126 jobs at the site. The facility, a public-private partnership involving $52 million in NS funds and supported by a $45 million investment by Pennsylvania, is part of railroad’s Crescent Corridor series of projects, a 2,500-mile network of rail and terminals that helps moderate truck traffic on congested roadways and reduce carbon emissions. "I want a job for every Pennsylvanian who wants one and a transportation system that helps to build and maintain a strong economy," Gov. Tom Corbett said. "Public-private partnerships are critical to the advancement of projects like this terminal that will strengthen our infrastructure and create jobs for Pennsylvanians. Jobs and prosperity, after all, are what these projects are all about." The new terminal, with its 670 paved trailer/container parking spots, will be a major gateway for freight in the Mid-Atlantic. NS projects with this facility, combined with other NS terminals in the state, as many as 800,000 long-haul trucks in Pennsylvania will be diverted off roadways in the commonwealth and onto trains by 2020. "Intermodal terminals like the Franklin County facility are proven centers for investment, infrastructure improvement, and business growth,” said U.S. Congressman Bill Shuster, chairman of the House Transportation and Infrastructure Committee. “I have long supported freight rail because it's efficient, safe, and environmentally responsible. I have no doubt that this facility will open a new chapter in Pennsylvania's proud railroading history and create new opportunities for growth in Franklin County and beyond." Pennsylvania has long backed NS’ efforts to expand intermodal opportunities in the commonwealth. In addition to the $45 million for the new Franklin County facility, Pennsylvania also has provided or pledged a total of $30 million for expanded operations at NS’ Harrisburg and Rutherford intermodal terminals. Additionally, the commonwealth successfully applied for a $15 million USDOT TIGER grant to further support the Rutherford expansion project. NS constructed the facility’s administration building to meet Leadership in Energy and Environmental Design (LEED) certification standards. The railroad is incorporating low-emission cranes and hostler tractors as well as the latest gate and terminal automation in order to maintain air quality and support truck drivers. The Franklin County Regional Intermodal Facility is the third Crescent Corridor intermodal terminal NS has opened since mid-2012, with facilities in Birmingham, Ala., and Memphis, Tenn., having started operations within the past six months. Construction of a fourth Crescent Corridor-related intermodal terminal, located in Charlotte, N.C. is underway. JACKSONVILLE, Fla. - January 21, 2013 - CSX today announced a major track capacity expansion on its premier River Line between northern New Jersey and the Albany, N.Y., region. The $26 million project, with plans for additional River Line capacity expansion in future years, will enable CSX to handle more trains and support the growth of crude oil moving by rail, intermodal shipments, automobiles and other businesses while maintaining strong service performance. A total of 18 miles of second track will be constructed over the next two to three years that will create additional capacity on the Hudson River's west shore. Preliminary work to prepare the sites in New York State at Ravena-Coxsackie, Catskill and Haverstraw is already complete with construction to begin early this year. In addition, CSX continues to invest in terminals, clearance projects and other initiatives to prepare for near- and long-term growth in the Northeast Region, including Philadelphia's Trenton Line where clearance projects are under way. These projects complement other network capacity improvements including ongoing construction of the National Gateway to clear a route from Mid-Atlantic ports to the Midwest for double-stacked containers. "It's critically important that we be prepared to meet our customer's needs as they grow," said Clarence Gooden, executive vice president and chief commercial officer. "The River Line is a key lane for growth and will further contribute to economic development as well as environmental benefits through CSX's terrific fuel efficiency." Capacity on the River Line was last expanded in 2005. Consistent growth in rail traffic on the line over the last several years, along with growth projections, now warrant additional investment to further increase the corridor's capacity. The River Line is part of CSX's premier I-90 corridor that connects Chicago with New York, northern New Jersey, and the Philadelphia areas, and supports some of the network's highest velocity and volumes - much like when it existed as the centerpiece of the predecessor New York Central System. "We continually model our growth projections to ensure that we are fully leveraging our network capacity," said Oscar Munoz, executive vice president and chief operating officer. "Today, we have sufficient capacity for our near-term growth projections, and the capacity expansion initiatives will ensure we're prepared for additional demand for our services. Demand for crude oil, for example, in the New Jersey and Philadelphia area may be as much as five trains per day, or over 400,000 barrels, over the next couple of years. Our capacity initiatives give us the capability to handle this growth along with business opportunities in our merchandise, automotive and intermodal sectors." CSX Corporation, based in Jacksonville, Fla., is one of the nation's leading transportation companies, providing rail, intermodal and rail-to-truck transload services. The company's transportation network spans approximately 21,000 miles, with service to 23 eastern states, the District of Columbia and two Canadian provinces. CSX's network connects more than 240 short line railroads and more than 70 ocean, river and lake ports. More information about CSX Corporation and its subsidiaries is available at www.csx.com. Like us on Facebook (http://www.facebook.com/OfficialCSX) and follow us on Twitter (http://twitter.com/CSX). The National Canal Museum is hosting the 30th Annual Railroad Film Night at 7:30 p.m., Jan. 25, at the Emrick Center, 2750 Hugh Moore Park Rd., Easton, PA. The film festival is about the Railroads of the Delaware and Lehigh National Heritage Corridor. Subjects that will be covered are the Switchback Railroad, The Ashley Planes, The Jersey Central, The Lehigh Valley and The Reading Railroads. Mitchell Dakelman, film curator of the National Railroad Historical Society, will present the films. The event will take about three hours and the doors will open at 7 p.m. Admission is $5 for Museum members and $7 for non-members. There is limited seating. For more information and directions, visit http://www.canals.org. This is Mitch Dakelman's annual movie marathon. It is always a great show. JACKSONVILLE, Fla. - January 16, 2013 - CSX Corporation has announced the appointment of Andrew Glassman as vice president of operations finance. "In addition to his excellent analytical capabilities, Drew brings valuable experiences from inside and outside of our industry and a unique ability to inspire and lead continuous improvement and customer-focused solutions," said Fredrik Eliasson, executive vice president and chief financial officer. Glassman served as assistant vice president of intermodal marketing since 2010. He joined CSX in 2004 as assistant vice president of financial planning and analysis. Prior to joining CSX, Glassman served in many financial leadership positions, including as senior director of corporate accounting for US West/Qwest Communication International and as financial director at AT&T's consumer division. Glassman earned a Bachelor of Science degree in Business Administration from the University of Connecticut and a Master of Business Administration degree from the University of Colorado. We are pleased to announce that The Big Little Railroad Shop will be at the Amherst Railway Society Railroad Hobby Show in Springfield, MA on January 26 and 27. We will be in either the Mallary building or the Stroh building. Please stop by and say hello. Below are 2 emails we received concerning Liberty State Park (NJ) and the historic Central RR of NJ, Jersey City Terminal Train Shed located in the park. Greetings, Thought you would like to know that yesterday (1/10/13) we signed a contract with Ruotolo Associates, fundraising professionals, to take the first baby steps toward raising the funds for stabilization of the historic Central RR of NJ, Jersey City Terminal Train Shed. Progress will be reported on our website under "Latest News." PS Work is progressing with the removal of Hurricane Sandy related debris from under the Train Shed, utilizing 100 NJ Department of Corrections laborers per day. The cleanup should be completed shortly. NORFOLK, VA. – Norfolk Southern Corporation will present its fourth-quarter 2012 earnings on Tuesday, Jan. 22, 2013, at 4:30 p.m. EST via teleconference and live Internet webcast. The company will issue its earnings results shortly after market close on Jan. 22. Those interested in participating via teleconference may dial 877-869-3847 several minutes prior to the call. An audio replay will be available until Jan. 29, 2013, following the live broadcast, by dialing 877-660-6853 and access number 407021. Received the following via email from one of our customers, and temporarily lost it in our Inbox. JACKSONVILLE, Fla. - January 7, 2013 - CSX worked with its customers in 2012 to locate 105 new or expanded facilities on its eastern rail network or on connecting short lines. These projects represent an investment by those customers of more than $3.2 billion and will ultimately create over 4,200 jobs among shippers in more than a dozen states. "These industrial facilities are expected to generate 162,000 carloads of new rail traffic in future years," said Clark Robertson, assistant vice president-regional development. "The 2012 results were especially significant in the energy markets, such as new ethanol and crude oil terminals, natural gas processing facilities and drilling supply locations. In addition, low natural gas pricing and abundant supply are prompting renewed manufacturing interest in the U.S. and specifically in markets served by CSX." attractive to shippers and communities alike. That means significantly lower carbon emissions and less wear and tear on public roads as CSX moves freight over its privately funded network. CSX also can offer customers the best rail connectivity to more than 70 ocean, river and lake ports. NORFOLK, VA. - Norfolk Southern Corporation participated in the location of 64 new industries and the expansion of 30 existing industries along its rail lines in 2012. New plants and expansions announced in 2012 represented an investment of $2.1 billion by Norfolk Southern customers and are expected to create more than 6,100 jobs in the railroad's territory, in future years potentially generating more than 141,000 carloads of new rail traffic annually. Norfolk Southern assisted state and local government and economic development officials throughout 19 states in helping customers identify ideal locations for new and expanded facilities. The balance of other projects secured during 2012 was distributed among several of the broad product areas Norfolk Southern serves. Norfolk Southern works with state and local economic development authorities on projects involving site location and development of infrastructure to connect customers to its rail system and provides free and confidential plant location services, including industrial park planning, site layout, track design, and logistics assistance. During the past 10 years, Norfolk Southern's Industrial Development Department has participated in the location or expansion of 1,021 facilities, representing an investment of $28.7 billion by NS customers and generating more than 48,000 jobs by those NS customers companies in the territory served by the railroad. Do not miss this last chance to visit the Model Engineers Railroad Club of North Jersey! After 79 years of operation, this club will be hosting its final open house. This is their final run and they would love to thank their supporters and friends for their years of loyality! Originally founded in Paterson in 1934, the club moved to their current location in High Mountain Road in North Haledon in 1954. The railroad is a point to point operation with yards at each end of the railroad. There is about 3000 feet of hand laid track on three different levels. The layout is loosely based on areas and locations in North Jersey. This final weekend will feature a steam only weekend. All trains will operate steam engines and will fit a prototype matching with the first half of the 20th century. MERCNJ is located only minutes away from Interstates 80 and 287, plus Route 208. Click on the following link for directions and map. As friends to the MERCNJ, the New York Society of Model Engineers is sad to see the closing of such a great organization. However, many of the members of this group have been welcomed into our organization and their expertise in the hobby will be a valued addition. Please take an chance and see this group for the last time this weekend.